Sound and image are often an unequal marriage when it comes to TVs. Philips have recognised this and developed the £229 full HD Philips 24PFT5231 TV - part of the 5200 Series. This is a 24 inch model with a Bluetooth speaker set beneath the screen in the hope of a better audio experience. TVs have been on a diet since the early naughties and unfortunately the audio quality has shrunk along the way. Larger TVs are more likely to be destined for a dedicated separate speaker set-up, but with smaller ultra-slim offerings, like this 24in (107cm) screen intended to be used in environments like a kitchen or bedroom, it is just impractical to set up separate speakers, so all too often we settle with the often lack-lustre inbuilt ones. Philips believe they’ve solved this quandary by building the speaker outside the screen to double as a nifty and rather stylish stand solution. 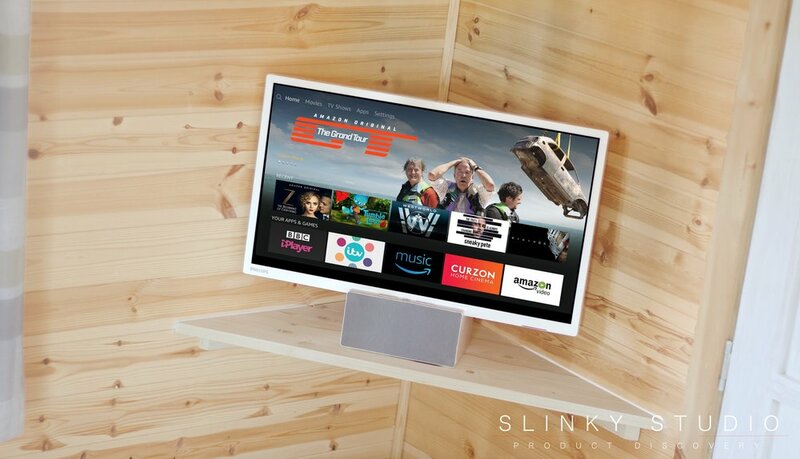 We particularly liked the iMac inspired stem which connects the TV to the speaker, producing a solid unit that can easily be moved around; this is key to recognise as the TV is intended to be sat on a surface as opposed to being wall mounted. Around the back of the Philips 24PFT5231 TV we find 2 HDMI, 1 scart, 1 USB, VGA, optical audio and 1 aux out ports. USB recording and video playback are enabled if you have a flash stick and it’s all fairly simple to set and operate. Most of the time we make use of pausing and rewinding live TV. Disappointingly there’s no ‘smart’ functionality, because there’s no Wi-Fi inbuilt. However, there is a solution we’d recommend to overcome this and that comes in the way of the fantastically low priced Amazon Fire TV Stick - this would only occupy one of the two HDMI ports, requires no separate power source and offers one of the best smart TV interfaces going with all the UK catch-up services featured over Wi-Fi. Although we somehow always manage to pick it up back to front, it’s comfortable to hold. The numerical buttons are a little squished together, but the overall layout of button functions are fairly self-explanatory and do what you want. Importantly the Philips interface changes channels and generally navigates smoothly and quickly. The inbuilt 8-day TV guide is a pleasure to read, navigate and within which to set programmes to record. One unusual quirk we have noted though, is that when using the TV guide, the channel we’re watching doesn’t continue playing in a corner of the screen. So previewing channels whilst browsing what’s on is not possible here. How good is the speaker? Upon opening the box, we plugged in the TV and first turned the 16W stereo speaker on - seconds later we were quickly paired with an iPhone over Bluetooth. What’s nice is that the speaker can be independently turned on/off and it has its own volume controls. Our first listening session with music impressed us with plenty of volume, a clean sound and an overall enjoyable style. With many inbuilt TV speakers you wouldn’t want to play your music library through them, but here we have a genuine multi-purpose product that can be used as a pretty good speaker in its own right. When it comes to the sound accompanying TV watching, this is a large step up from inbuilt speakers in other smaller TVs, providing a resonating bass that is encouraged by design as it has to be rested on a surface. For instance, we have our Philips 24PFT5231 TV standing on a wooden shelf and this amplifies its bass footprint significantly. We’ve listened to a lot of DAB radio on this TV and the spoken word is notably clear and crisp. Mid and high ranges are well balanced and the overall boosted soundstage from this speaker makes for a much improved experience - with plenty of volume to fill the largish open plan area ours has occupied during our review of it. With Freeview HD inbuilt, we wanted to see if this 1920 x 1080 resolution LED backlit display is an equal match to its speaker. You can hop into 'menu' to adjust contrast, picture modes and brightness - we had a play and found the ‘natural’ picture mode to be the most generous across the board. HD Freeview channels and content in general are enjoyable to watch, with vivid colours, an eye for accuracy in terms of gamma, and highly notable is that the blacks are deep, making imagery with harsh shadowing, like that often found in movies, not 'noisy' to look at. The only noticeable cause for concern is how the screen deals with motion. For instance, whilst watching snowboarding at the Winter Olympics on Freeview HD, the fastest motion shown on close-ups was ever so slightly jagged; but this is a very minor criticism for what is an oversize first rate display. The most important question with any flat screen TV concerns that of viewing angle and does it matter where you are sitting when viewing? Well, the first revelation with this one is that, due to its matte display, reflections haven’t been an issue on bright days even though our TV is situated within the corner of the room across from a large window. But even more importantly, Philips 176 degree claimed viewing angle proves itself true when viewing the display at near sideways on. There are no signs of harsh colour hues or the appearance of shadowing across the display when watching at extreme viewing angles - the picture is impressively solid! Worth mentioning is the inclusion of Philips Digital Crystal Clear technology, which decides the optimum colour, contrast and sharpness of the picture you receive. When viewing HD content you don’t appreciate it so much because the definition is good anyway, but in contrast non-HD broadcasts, such as the rough and ready ‘Come Dine With Me’, look rather flattering on this Philips display. With its dynamic interpretation of overall colour and more notably contrast, it really is a good all-round display for TV watching that doesn’t feel compromised due to its size. The Philips 24PFT5231 is a TV that repositions the balance of the often overlooked sound quality from in-built smaller TV speakers. Thinking literally outside the box, they have designed an extremely engaging audio and visual experience for areas like bedrooms, kitchens and studies.